Fee Only Financial Advisory Services were introduced in Italy in 2007 following the implementation of the European Parliament’s Directive 2004/39/EC Markets in Financial Instruments Directive, known as MiFID, while in the United States of America and Great Britain it has been well established for the last 40 years and it is the one savvy investors rely on. The Fee Only Advisor, unlike the bank advisor and insurance agent, does not sell products, instead he/she recommends and suggests the best investments to turn to. To the less experienced investor, the product indicated by the bank advisor or insurance agent may look the same as the one suggested by the Independent Advisor, but that is not the case. The bank advisor’s and insurance agent 's proposals relate to the intermediary they work for, while the advice of the Independent Advisor includes several financial products with different features and margins of profitability, selected among all available ones in the marketplace. The value of Independent Financial Advice is precisely the independence enjoyed by its players who, not depending from any bank or insurance company, do not fall into the typical conflict of interest, i.e. proposing bank or insurance products for the sole purpose of earning the commission. HCinque’s Clients prefer to pay out of their pocket a professional who works for them rather than relying "for free" on an Advisor who works exclusively for a bank or certain insurance companies. The key feature of HCinque services is the maintenance of pre-existing relations between the Client and the intermediaries used such as banks, brokerage companies, asset management companies, etc.. Under no circumstances HCinque services involve the direct management and holding of the Clients’ financial instruments or money. Clients maintain absolute control over their assets. 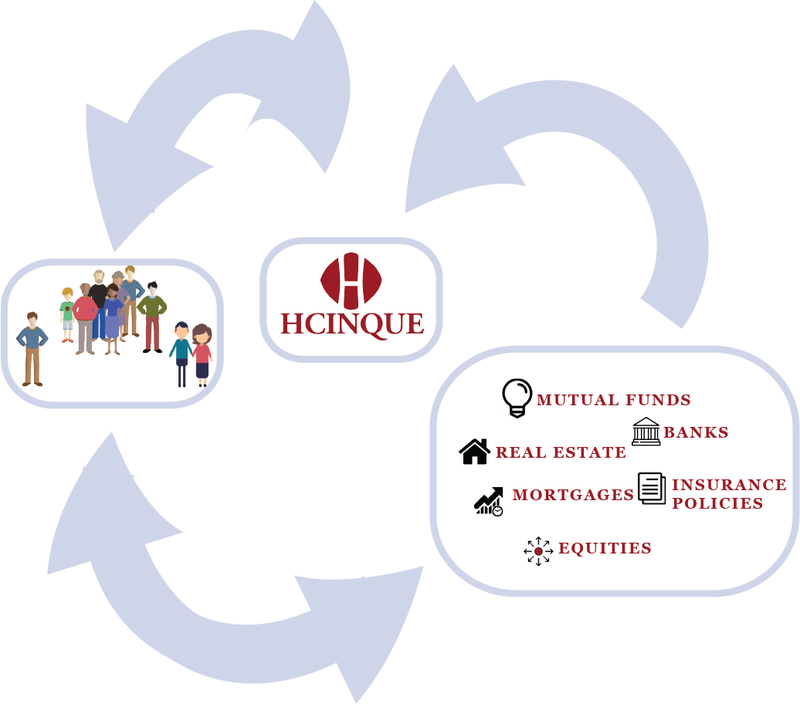 HCinque’s technology enables maximum efficiency in handling the Client/markets data flow and the opportunity to deliver an aggregate vision of the assets in which all investment classes appear, both financial portfolios and real estate assets as well as private equity investments.